If you live in a colder climate, it is a good idea to start your plants indoors from seed to give them a head start. Not only does this increase the variety of vegetables you can plant. It is simple, fun and cheap. You will be amazed at how much money you save planting seeds indoors. A package of 20 pepper seeds cost two or three bucks compared with a couple bucks per plant started in a nursery. 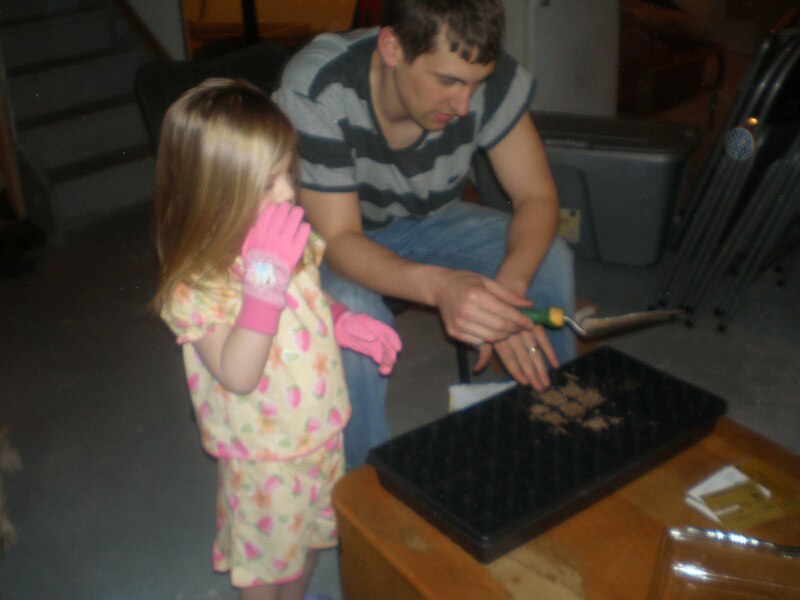 The main thing that the vegetable seeds require to grow is adequate heat and a light source. Depending on how extravagant you want to get, this requirement can be fulfilled with a big south facing window or high tech lighting. A window will work in most cases but not all. If you are starting your plants in the basement, you will need artificial light. You could spend big bucks on fancy lighting but this is not necessary for a beginner. Unless you are starting a greenhouse or a lot of starts, a standard shop-light will work. Standard bulbs will give off enough heat and light to grow most plants but you can enhance your system with a couple of items. One option is to purchase heat mats that ensure your soil is at the proper temperature for germination. This is key to maximizing the potential of your seedlings. If your soil is not at the proper temperature, your seeds will develop sporadically or sometimes not at all. Another option is to purchase fluorescent bulbs for your shop-light. Fluorescent bulbs produce more light than standard incandescent bulbs and will help plants grow. These bulbs come in cool white light and warm white light. Most indoor gardeners will pair one type with the other. This combination will let your plants grow to their maximum potential. The next piece of the puzzle is picking out your soil. Planting your vegetable seeds in the right type of soil is one of the most important decisions you will make. However, picking the right type of soil is easy as long as you don't go cheap. Do not dig up some dirt in your backyard and try to plant your vegetable seeds in it. Ask your local garden store for a soil-less seed starting mix. They will be able to set you up with a product that will work. I use Jiffy brand but any of the other brands will work as well. Once you have your light source and soil, there is one last thing to decide before planting your vegetable seeds. You will need to know what you will plant the seeds in. Any shallow container that allows for drainage will do the trick. The container can be as simple as a cardboard egg carton or a fancy store bought container system. Crafty gardeners prefer to come up with their own solutions out of things lying around the house. However, I prefer the container system because they are cheap and can be used year after year. Any container system that has a plastic lid and individual trays will do the job. I like to pick out the cheapest option that has big enough trays to handle my plants. Some tray systems have a lot of slots but the slots are smaller. This results in the plant's roots not developing correctly because of the tight space. Make sure to keep the container covered and in a warm space until the seeds sprout. Before you sow your vegetable seeds, you will need to know the right time to start them. This is very important. You do not want to plant your seeds too early or too late. The key to knowing the ideal time is finding out the last frost date in your area. This information can be found on many of the big seed companies website by plugging in your zip code. Once you find your date, the packaging on each individual packet will tell you when to plant the vegetable seeds. You need to count back from your last frost date to find the correct time to start your seeds. Next comes the planting. When you plant the vegetable seeds, fill each slot half way with the planting mix. Then, add enough water to make the mix moist. Adding water at this stage helps overcome one of the hardest parts of working with the soil-less mix. Most soil-less planting mixtures puff up when water is added to them. This makes working with them difficult at first but is an easy problem to overcome. When adding water, push down on the mix with your fingers until the water works into the mix. If you still feel water because you added too much, add more dirt and start the finger pushing process again. Once completed, plant the seeds according to each packets directions. Make sure to read each packet because different types of vegetable seeds call for different things when planting. Once planted, scoop in the rest of the soil. Again, pay attention to the directions on each individual packet. Some seeds will need to be planted deeper than others. Add water until the mix is moist from top to bottom. When it comes to watering the plants, make sure you don't drown them. I drill a couple of holes in the top of a Gatorade bottle for a simple watering device. This allows the water to drip out slowly to the plants. When watering, make sure you are soaking the dirt throughout the container. This is important because the plant will not grow if the roots are not getting enough water. Starting vegetable plants indoors is simple. If you can read and follow directions, you can grow them. Once the seeds turn into plants, it will be time to thin and transplant them to their own container. Hey Greg, Check out Luke's Youtube channel dedicated to gardening. On Youtube search for MIgardener. He's having a lot of fun with it. And is getting ready to plant outdoors in raised beds. nice- looks like we need to team up.